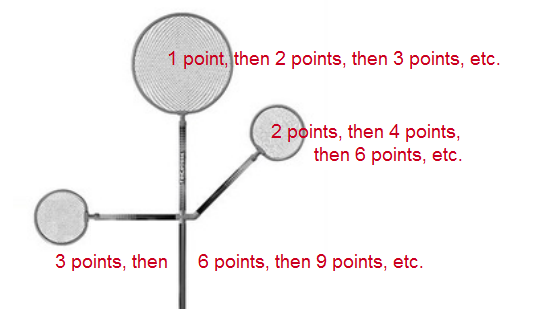 ​2 points can be added to your score, or subtracted from your opponents score...catchers choice! The game cannot be won by a deflection catch, you have to make a goal to win. During the game, every player must catch the thrown TriCrosse ball from behind the goal from the opposing player. If the ball is not caught, 1 point is awarded to the opposing team. If a ball is thrown outside the playing area and is out of bounds, the opposing player does not need to catch the ball. This new, challenging add-on was sent to us by Dillon, a huge TriCrosse Fan. If you throw the ball into a goal you get the point value. On your next throw, if you score in the same goal you just made, you get double the points. Next throw, score in same goal...three times the points., etc. If you miss, goal values reset. As your throwing skills improve, you can use different combinations of throws to keep your opponent on their heels during Must-Catch play (described above). Watch the video below to see different throwing techniques to apply curves to the ball and bring your TriCrosse game to the next level. Got your own twist to the game or trick shot to brag about? Yo! Check this out! Click on our Contact Us page and send us your twist to the game or trick shot. If the team approves it, we will add it to the Advanced Play page. Don't forget to create a cool name for your trick shot, so we can name it after you.